On the surface, Infinity Walk can appear to be a simple movement pattern. A casual observer might describe Infinity Walk as walking in a figure eight while looking off at a 90-degree angle from the path you are walking, and then adding more challenges to it as it becomes easy to do. Well, on the surface, that is just about all you might see, especially if you have no training in physical medicine or neuromotor therapies. This is why I can describe Infinity Walk to a child as being a game of “How many things can you do at once”? It looks very learnable, and easily inspires interest as a personal challenge that can be increased in complexity as each new level of training is mastered. A brief glance at the drawing on the next p age will give you an idea of how an untrained eye might see the Infinity Walk in use. Our illustrated person is walking a repetitive figure eight pattern while watching television. Looking a little closer we might wonder about the instructions regarding the 90-degree angle placement of the circles. Why might that be necessary? You might wonder if part of Infinity Walk’s effect has to do with constant shifting between clockwise and counterclockwise circling. If the drawing was animated, you might notice other movement besides walking and circling. You might notice that by holding a visual gaze on the television an automatic neck reflex rotates the neck from far left to right and then back again. If you noticed this much, then you’ll also notice that the eyes are going through this same pattern of lateral eye movement from far left to right and then back again. We speak of “watching” TV, but we listen as much as we watch. And so, our illustrated person is also turning one ear and then another to the television speaker. 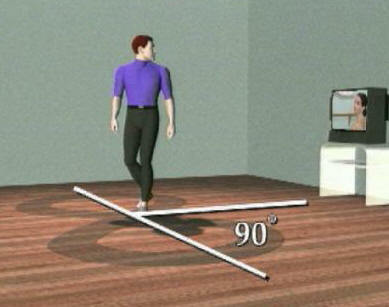 If we could watch this movement for a few minutes we might also see differences in how the arms are swinging, how the hands are held, how the feet are placed on the floor. We might notice less rotation on one side of the body than the other. We might wonder why movement in one circle seems to have a different quality to it, as if the body felt less comfortable or less familiar with one direction of circling than with the other. The longer we observed, the more we would begin to see an unfolding stream of information about differences between the two lateral halves of the body. And, if we had a conversation with this illustrated person, we would find that the acts of talking and listening and thinking would change its movements in strange and interesting ways. And if we watched and talked and listened even longer, we would discover that perceptions and memories and feelings also affect the Infinity Walker’s movement in laterally asymmetrical ways. Infinity Walk allows us to use our own body as an instant biofeedback system: The brain, speaking through body motor language, reveals its ineffective habits to us. Next, our own self-observations, and those of other trained Infinity Walk observers, contribute insight and encourage the perceptual shifts that will change the quality of Infinity Walk movement. The brain’s progress in making these changes is easily monitored in the Infinity Walker’s movements. Success is immediately obvious to the eye and instantly reinforcing to the person. Motor, sensory, perceptual, emotional, cognitive and relational habits can be monitored and positively impacted by Infinity Walk training.